Last year, Isaiah’s Neumayer-Grubb’s family discovered that he had a brain tumor that would need to be surgically removed. 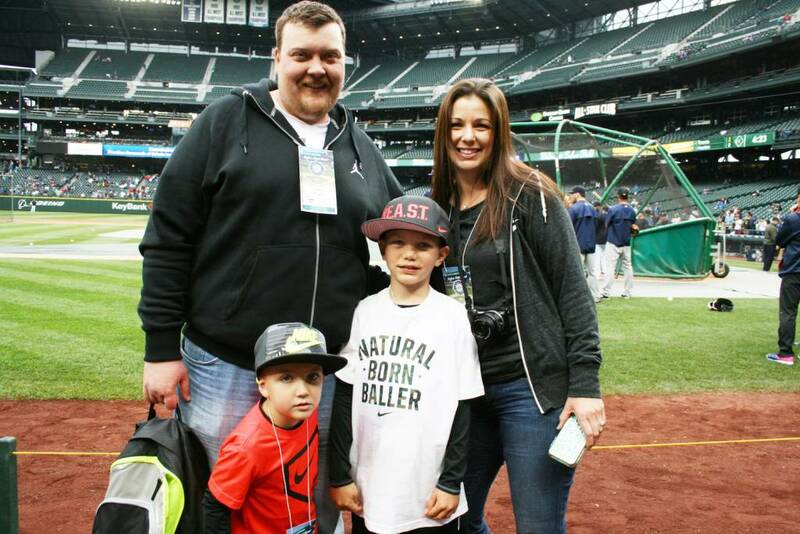 We sat down with his mom, Melissa, to learn more about Isaiah and his Doernbecher story. How would you describe Isaiah? He’s a charismatic little guy who makes friends wherever he goes. He shines at everything he does and loves to stay active. Isaiah walks into a room and you can feel his presence – he has this wild sense of humor that makes you want to be around him all the time, just to see what he’ll say next. He fills your soul with happiness. When did you know something was wrong? Isaiah was getting headaches that were becoming more frequent – about three a week. His primary care provider referred him to a neurologist, who thought it was just childhood migraines and didn’t seem super concerned since Isaiah was otherwise very healthy and still taking part in sports, in dance and in school. Just in case, though, the neurologist recommended an MRI. We went in on a Friday and were told Isaiah would be in and out in 45 minutes. He was back there for about two hours. We knew that day that something was wrong, but didn’t hear back until the following Monday that he had a lesion on his brain. I remember trying to write down the word ‘lesion’ on a piece of paper, but in that moment I couldn’t spell it – I just couldn’t wrap my head around it. The space in between getting this news and going to the hospital was the scariest, really. We were Googling “lesion on brain” and getting search results ranging from “it’s nothing” to “he could die.” That was the last time I Googled anything. Our neurologist referred us to Dr. Selden, whom he called the “best of the best.” My husband and I were super nervous – you don’t really know what to expect when you’re talking to a neurosurgeon. But the moment we walked into Dr. Selden’s office, we felt like we already knew him. It wasn’t what I expected at all – we felt instant comfort and instant safety. He really is incredible. At this first meeting, he told us he believed Isaiah’s tumor wasn’t cancerous and didn’t want to jump into surgery right away. He said he wanted to take it to the tumor board so eight other experts could weigh in. 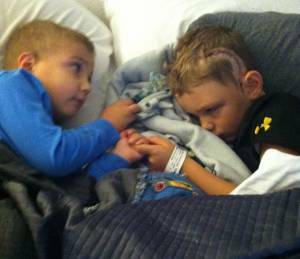 In the meantime, a sleep-deprived EEG showed Isaiah had been having absent action seizures. At the time, it just seemed like Isaiah would space out and ignore us for 30 seconds to a minute. 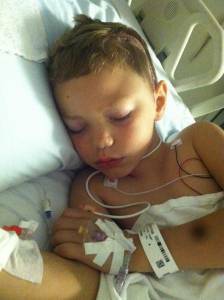 Once we found out, Isaiah started anti-seizure meds and we made some life changes almost immediately. We went from having a perfectly normal 7-year-old to having a child we had to keep an eye on at all times. He couldn’t ride a bike by himself or even get in the bath by himself. It was very, very surreal. A week later, we got a call from Dr. Selden’s office that the tumor board was recommending surgery – the tumor was large enough that he and his team needed to determine what it was. I felt like someone was kicking me in the stomach. He explained all of the factors that went into the recommendation and the associated risks and benefits. Dr. Selden told us he’d be putting together the best team possible for Isaiah’s surgery. They would practice ahead of time on a 3-D model constructed using scans from his MRI. Brain surgery isn’t without risks – we had to consider possible impacts to Isaiah’s speech and movement of his legs, and we also had to consider the possibility of paralysis and death. We didn’t know what our son’s future would look like with surgery, but we didn’t know what it would look like without it, either. The hardest part for us was that it was ultimately our decision. The one thing Dr. Selden said that still stands out to me was, “I believe I can do this surgery. I know I can.” I just remember the way his eyes looked when he said that – it was genuine, not cocky. I’m a pretty intuitive person and I had no doubt that he could do it. We decided to go ahead with the surgery. We scheduled the surgery for October 27, which meant we had about a month to wait. Our family took some time off work to go to the beach for five days, and I decided we were going to live life to the fullest for that month so that if I lost my son, he would go with peace and love, not with fear or uncertainty. We had no control over the situation, so we spent those weeks doing all of the things we could. Isaiah is a huge Oregon Ducks fan, so we got tickets to a UO game. 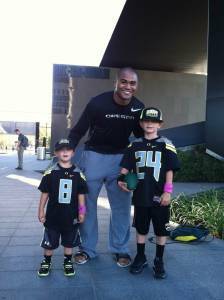 He always said he was going to play ball with Thomas Tyner someday, not realizing the age difference between him and Thomas. After a family friend told Thomas about Isaiah, he arranged to meet us before the game. He gave Isaiah a pair of his cleats and introduced him to Marcus Mariota. Thomas is truly a fantastic kid – he’s exactly what I want my boys to be like. I want to give his mom a hug and tell her she did a great job! Our friends got together and planned a Halloween party for Isaiah since he would be missing it that year. More than 100 people came out to celebrate one of Isaiah’s favorite holidays with us. People were amazing – AMAZING. I can’t put into words how much gratitude and humbleness I feel. Batman was a way of escaping for Isaiah – if Batman could overcome anything, he could, too. 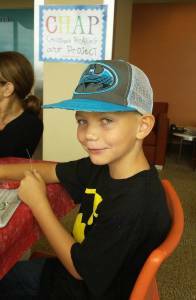 On October 27, the day of Isaiah’s surgery, students and staff at his school all wore Batman gear, and the kids in his class wore black and yellow bracelets with Isaiah’s name on it. 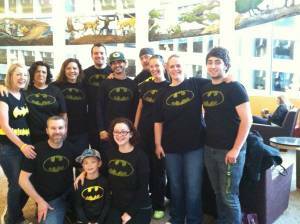 A lot of our friends and family flew in for the surgery, and they were all wearing Batman shirts. Isaiah was wearing his Batman shirt before he went into surgery. There were probably 30 people waiting with us at the hospital. It was absolutely amazing. I didn’t realize how terrified I was until they called to say the surgery was complete. I grabbed my purse and backpack to head upstairs and I cried in a way that I’d never felt before – I didn’t know if my son could talk or walk, but I knew he was alive. It was almost like a release of all of this pain and fear. Upstairs, Dr. Selden came out and said the surgery went great and his team was able to remove more of the mass than they’d anticipated. We were crying and hugging him – even my husband, who’s not a hugger! We knew the first 12 hours would be touch and go with a lot of neuro checks. Isaiah woke up yelling, so we knew that, despite being really scared, he had the ability to talk. 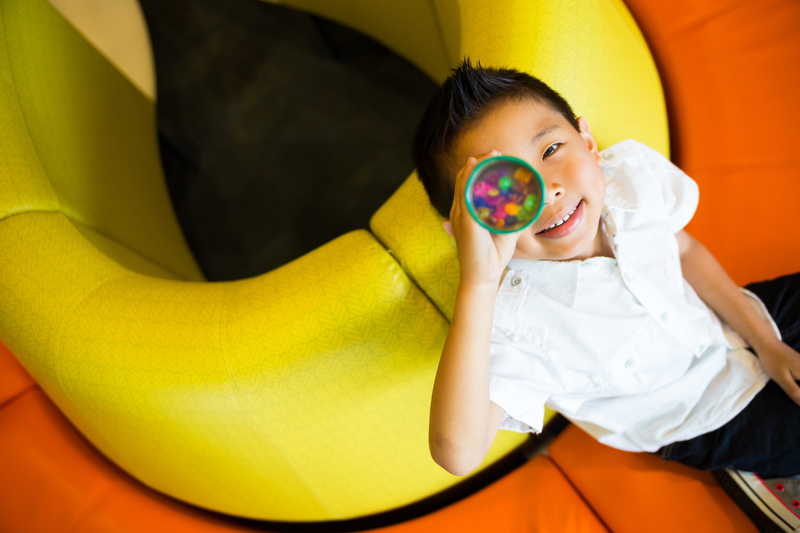 As a mother, I can see that our time at Doernbecher was incredible. Isaiah just remembers being very angry and confused – he went into surgery feeling fine but no matter how much information we gave him prior to it, he wasn’t prepared for how he would feel afterward. He couldn’t fully grasp it – none of us could. Isaiah didn’t want to eat or walk. Dr. Selden said if he did, he could go home. He walked around that ICU unit, and people were clapping and cheering. He was still so mad! I’m sure if he knew any bad words, he would have been saying them. Dr. Selden released him to go home that same day, just two days after his surgery. We wanted to prepare our younger son, Jameson, for Isaiah’s arrival – he was 3 at the time. Isaiah had two swollen, black eyes and the cut on his head, plus he just generally looked pretty frail. My brother Tommy told Jameson that the doctors had to fix Isaiah up, and he would be fine – Jameson pushed himself out of Tommy’s arms and followed us back. He jumped up on the bed to lie next to Isaiah. My two crazy, hyper, ridiculously energetic boys were lying there together, holding hands and not saying a word. It was amazing. I could see the color come back into Isaiah’s face. How do you explain something like this to a 7 year old? We always made a point to tell Isaiah the facts – what we knew for certain – about what was happening. My husband and I would try to process the information we were receiving before having a conversation with him. We wanted to first handle our emotions so we could focus on helping him handle his. At the initial appointment with Dr. Selden, Isaiah just knew we were there to get his headaches checked out. There’s no sugarcoating with Isaiah – downplaying the news actually makes him nervous. He’s very intuitive, so you have to be straightforward with him. Dr. Selden picked up on that immediately. There was also talk of Isaiah getting an Xbox if he did indeed need to get surgery, which was looking unlikely at our initial appointment. After finding out the tumor board had recommended surgery, we had another appointment with Dr. Selden. We sent Isaiah out of the room to ask the hard questions (this was something we learned early on: Always bring another adult to appointments with you so your child can leave the room when necessary). Once we had made the decision to go ahead with the surgery, we sat Isaiah down and told him. We compared the lesion to a freckle on Isaiah’s brain, and said we’d heard that freckle was what gave Batman his superheroes. Isaiah had a lot of questions – Is Dr. Selden going to have to cut open my head? How big will it be? Will they shave my head? At this point, it dawned on him that he just might be getting that Xbox! He seemed completely fine with the surgery at first, but four or five days later, the fear kicked in. We spent the next few weeks answering his questions (and writing down the ones whose answers we didn’t know so we could find out) and trying our hardest to be calm. A lot of waiting areas at Doernbecher have arts and crafts areas, which was a lifesaver on so many different occasions. In fact, he and my 19-year-old daughter made a necklace together right before Isaiah went into his surgery. 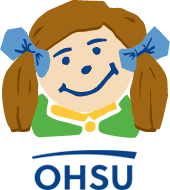 What other advice do you have for other families facing serious health problems? That’s a tough one, because I get to say this being on the other side. We’re very lucky. I think it changes you – you learn how to live in the moment. I faced the possibility that I could lose my kid, and I made a conscious decision not to think about that every day (though that’s not to say it didn’t go through my mind every day). You’re thinking about your child’s mortality and you’re watching him face it, too. As a parent, you think a lot about how you would want your child’s last moments to be if these are indeed to be his last moments. Another piece of advice: No Google. That’s a big one! Google is scary. At this point, we’re not planning on another surgery. We continue to monitor his seizures and our goal is to get him off of those meds at some point. 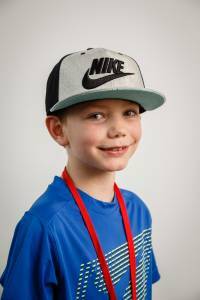 Learn more about Isaiah and the rest of this year’s incredible Doernbecher Freestyle patient-designers here, and read a blog post by one of the Nike graphic designers who worked with Isaiah here. We hope we’ll see you at this year’s collection reveal and auction on October 23! Isaiah is truly a remarkable young man. His laughter and smile is contagious. Feeling blessed to be apart of his life. Dr. Selden has been in my boys head 3 times.. I wouldn’t want ANYONE else!!! Our last surgery was in May. Cooper is doing great getting ready for his senior year of high school. He wants to be a senator and I know he will do great. Thank you Dr. Sheldon for giving me our boy back. I couldn’t agree with you more Dr Selden is amazing and my son is proof! I am so glad your son’s surgery went as well as my son’s. It’s been 2 1/2 years since and my son is doing wonderful! This is very inspiring! Thank you for sharing!